Happy Memorial Day! I hope my fellow Americans are enjoying the day off. Twelve-year-old Ella Mae Higbee is a sensible girl. She eats her vegetables and wants to be just like Sergeant Friday, her favorite character on Dragnet. 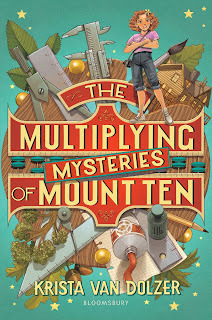 So when her auntie Mildred starts spouting nonsense about a scientist who can bring her cousin Robby back to life, Ella Mae doesn’t believe her–until a boy steps out of the scientist’s pod and drips slime on the floor right before her eyes. But the boy is not Robby–he’s Japanese. And in California in the wake of World War II, the Japanese are still feared and mistreated. When Auntie Mildred refuses to take responsibility, Ella Mae convinces her mama to take the boy home with them. It’s clear that he’ll be kept like a prisoner in that lab, and she wants to help. Determined to do what’s right by her new friend, Ella Mae teaches him English and defends him from the reverend’s talk of H-E-double-toothpicks. But when the boy’s painful memories resurface, Ella Mae learns some surprising truths about her own family and, more importantly, what it means to love. As usual when I do an interview, the questions are centered around the five things I loved most. 1. It’s fantastic how you seamlessly wove in historical tidbits that adults have probably heard somewhere–for example, that the general public didn’t know President Roosevelt was in a wheelchair until after his death. Was it challenging to figure out where these would fit? Did you have a file of historical facts you wanted to include and couldn’t? I didn’t have a file of historical facts, but now I wish I had! For the most part, I researched the 1950s in general, then drew on that working knowledge as I drafted individual scenes. For instance, the scene in which I mentioned President Roosevelt has a reference to wheelchairs, so I tried to think of someone in a wheelchair that Ella Mae would have known. President Roosevelt came to mind, and it was only as I was fact-checking myself that I discovered the general public didn’t know the full details of his condition until after his death. 2. The message that there are two sides to every conflict (or war) and that individuals shouldn’t be judged by ethnicity is especially appropriate today. There were so many nations involved in World War II. Why did you choose to tell the story of a Japanese character versus German? Was it strictly because he would stand out so much physically? Yes, the primary reason I made my regenerated man Japanese was because he would stand out so much physically. I wanted the characters to be able to have an immediate reaction to the way he looked. 3. I loved how much of an impact Takuma, as a single person, had on so many lives. Takuma struck me as culturally appropriate but not stereotypical. How did you go about developing his character? I’m so glad you thought Takuma was culturally appropriate but not stereotypical! I spent quite a bit of time researching Japanese culture in an effort to get his character right. One thing I learned is that Americans tend to value independence whereas Japanese people tend to value interdependence, being a small part of a larger and more important whole. That quality suited the character I wanted to develop. 4. The voice felt so strongly middle grade despite the seriousness of the situation, particularly in regard to Ella Mae’s roller-coaster emotions about her friendships with both Takuma and Theo. Did her voice come naturally to you, or did you have to really work on keeping her at that age? Ella Mae’s voice came so naturally that I’ve started to wonder if I was a twelve-year-old girl in 1952 in another life :). I’ve worked on this book off and on for the last four years, and no matter how much time I spend away from it, I can always pick Ella Mae’s voice right back up. Of all the characters I’ve written, Ella Mae is my favorite. 5. I really loved the ending, and I don’t want to spoil it for anyone, so I’ll make it a more general question. Did you know from the beginning how the story would need to end, or did it surprise you as you were writing? I’ve always had a very clear idea of how this story was going to end. As soon as I wrote the first chapter, I knew exactly how I was going to write the last few chapters. Not everyone likes the ending—one editor in particular rejected the manuscript precisely because she didn’t like the way it ended—but in my mind, it always had to end this way. If you haven’t already picked this book up, do it now! But I am giving away a signed copy to one lucky winner. North America only, please. Click on the Rafflecopter below to enter. Good luck! Very unique concept for this one. Great interview and insights from the author. I’ve added the novel to my TBR list. Thanks for featuring. I love the concept of this one–and I lived in Japan for three years. So I’m looking forward to getting to know Takuma. How cool! I didn’t mention it because I didn’t want to interrupt the flow of the interview, but when I was around the same age as Ella Mae, we had two Japanese exchange students (college age) stay at our house for three weeks. Takuma reminded me of them in their general temperament. I keep hearing about this book, and it’s all good things. Nice interview questions and it simply makes the book more intriguing to me. Thanks for the post. How did I not know about the historical aspect of this story?!?! I am really looking forward to reading now! Yes, you would really like this one! This sounds like a fun read. Going on the to-read list! I love the mix of historical and fantastical.